How does (the new) writing space refashion its predecessor? Even though the Bolter’s argument focuses on electronic writing, I believe the same applies for audiovisual (AV) media. The development of AV started around 1930s. At the time, it provided a revolutionary way for people to communicate – our expression is no longer limited to verbal, but can also be visual (or both at the same time). With its specific affordances, how do AV media make our thoughts visible? How did they impact the way we communicate and teach? In this essay, the development of audiovisual (AV) media is revisited to explore the impact of AV on the importance of printed text and for education. AV materials are both visual and verbal, and are available in various forms and sizes. They include film and video, which were produced by machines like film projectors, lantern slide projectors, tape recorders, television, and camcorders. This list continues to expand as people seek to communicate through multimedia. 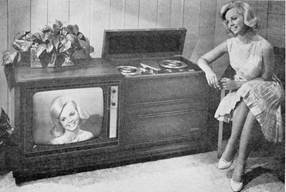 The development of audiovisual media was based upon visual media. At the early stages of AV development, 52% of American schools were using visual films and 3% were using sound films according to a National Education Association (NEA) survey performed in 1933. AV development started to gain momentum after WWII. One of the reasons is that people came back from the war with first-hand experience of rapid, massive training through the use of motion pictures and other AV media. 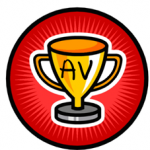 Since then, more people were receptive to the idea of learning from AV. In addition, the baby boomer generation started going to school. New schools were built with new AV equipment, and hence there was a need for technological and pedagogical support. Positions were created for building and district audiovisual coordinators. In 1947, the Department of Visual Instruction (DVI) of NEA in the United States changed its name to the Department of Audiovisual Instruction (DAVI), which developed into today’s Association for Educational Communications and Technology (AECT). It is interesting that AV was viewed as the best, or the only solution to “teaching more” and providing “meaningful learning experience” in limited time because our goals for using educational technology today is still the same. It is also interesting that Wilson pointed out the possibility to express more contents with AV, which is impossible with text alone. AV was seen as a media to complement, but not replace text. The integration of AV in the field of education was made possible by the contribution of many people. They include Thomas Edison, James Finn, and Edgar Dale. Until now, motion pictures are often used to supplement teaching, but have not replaced textbooks. It seems like textbook is going to stay, though it might be presented in different forms to include different media. Looking into Edgar Dale’s insight provides some hints as to why this is so. In 1946, Dale’s cone of experience was published his textbook, “AudioVisual Methods in Teaching”. 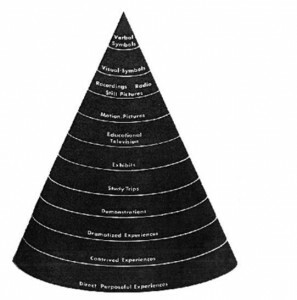 The cone of experience (Fig. 1) was a tool for media selection, with in a continuum from concrete teaching techniques and instructional materials at the bottom of the cone, to the most abstract techniques at the top. Figure 1: The original labels for Dale's ten categories are: Direct, Purposeful Experiences; Contrived Experiences; Dramatic Participation; Demonstrations; Field Trips; Exhibits; Motion Pictures; Radio; Recordings; Still Pictures; Visual Symbols; and Verbal Symbols. Many misconceptions arose, that the amount of content retained increases with the level of concreteness of the learning experience. This misconception was cross referenced in many papers in the discourse, as demonstrated in Figure 2 and 3. Figure 2. Percentages were added to Dale’s Cone of Experience. Figure 3. 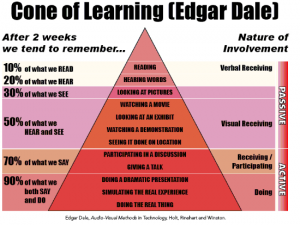 Instructional Strategies and Retention Rates. 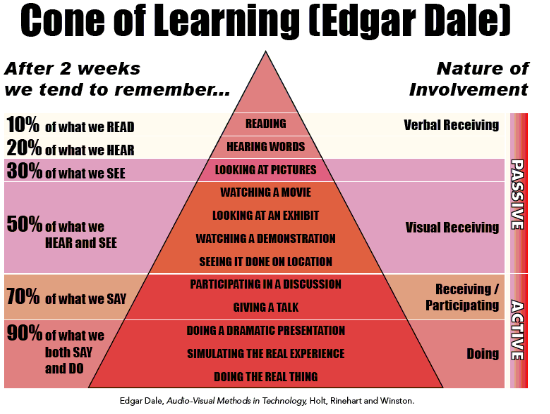 Dale’s cone of experience was very influential in the field, as it was the first attempt in the discourse of the field to integrate media with learning theories. The term “messages” within this definition indicate the shift in focus away from the AV equipment (tape and films) to design of the content that is being communicated. The discourse of both Finn and Dale, two influential scholars in the AV movement, agree that it is not the medium that controls the efficiency of communication, but appropriate media, or a combination of medium needs to suit particular user and content. Text has different affordances than AV media; effective communication is achieved by different media complementing, but not replacing each other. “AECT History.” AECT. Web. 17 Nov. 2010. <http://www.aect.org/about/history/>. “AVCR.” AECT. Web. 17 Nov. 2010. <http://www.aect.org/about/history/avcr1.htm>. Bolter, Jay David. Writing Space: Computers, Hypertext, and the Remediation of Print. Mahwah (N.J.): Lawrence Erlbaum Associates, 2001. Print. “The Human Touch: in the Rush to Place a Computer on Every Desk, Schools Are Neglecting Intellectual Creativity and Personal.” Web. 17 Nov. 2010. <http://findarticles.com/p/articles/mi_m0MJG/is_4_4/ai_n6335687/>. Januszewski, Alan. Educational Technology: the Development of a Concept. Englewood, CO: Libraries Unlimited, 2001. Print. “Print Media Vs. Broadcast Media | EHow.com.” EHow | How To Do Just About Everything! | How To Videos & Articles. Web. 17 Nov. 2010. <http://www.ehow.com/facts_6389859_print-media-vs_-broadcast-media.html>. Reiser, Robert A., and Donald P. Ely. “The Field of Educational Technology as Reflected through Its Definitions.” Educational Technology Research and Development V45.N3 (1997): 63-72.